I have always received good service from Robinsons Self Storage. Their quality has always met my expectations and everything is communicated in a professional and timely manner. We offer two sizes of storage. A complete container or a half container. The measurements for a whole container are shown below. 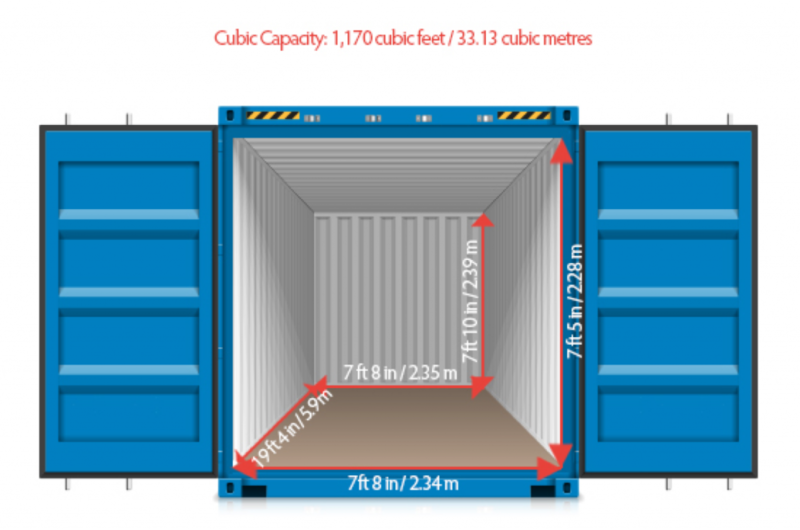 A half container has the same dimensions but is only 10 ft/3.04m long. This depends on how long you will need the storage for and what size of storage you require. You can call 01324 612540 or 01324 634399 to speak to a member of our team who will give you a quote. All quotes are per month and include VAT. Storage is charged monthly and in advance. You can also call into our office to discuss your storage requirements. You can move out at any time during your payment period, you just need to give us 7 days notice to move out of your storage. This can be done by calling the office on either 01324 612540 or 01324 634399. You can also call into the office in person. You also need to confirm when you have emptied your storage container. This is done by coming into the office to sign out. Please leave the container in the same condition as when you began renting it and remove your padlock from the door before leaving. Office hours and access hours? The office hours are the hours of operation for the property when staff will be available to assist you with your storage needs or moving and packing supplies. These hours are Monday to Friday 8.30 am to 5.30 pm. Saturday 8.30 am to 1.00 pm. Access to storage is available 24 hours per day through our electric gate and personal fob system. Do you rent vans to help me move? We rent vans through our sister company Robinson’s Hire Drive. Contact them on 01324 634399 for competitive rates and ask about special offers for storage customers.